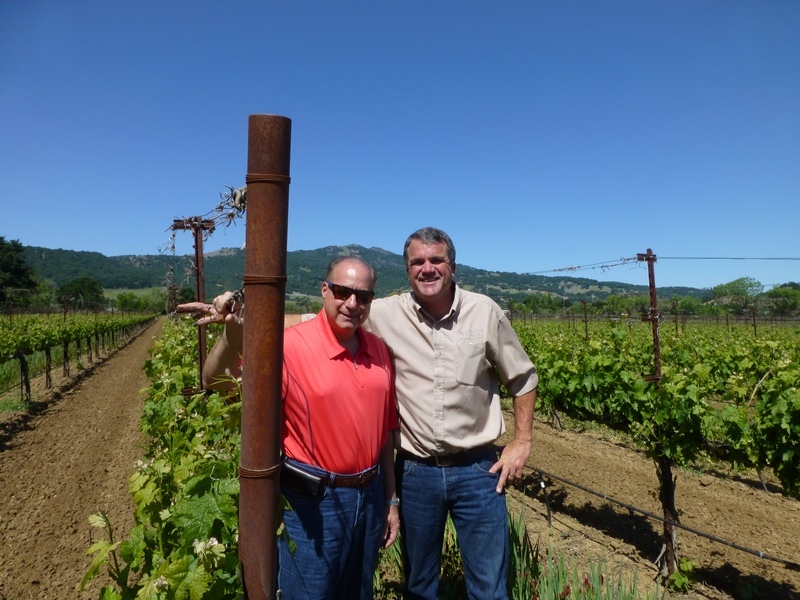 Our grower Ron and Frank talkin’ dirty! May 2013 timeframe… this bud’s for you! In my last update, I proposed a date for our next social one week later than the above date; however, after hearing from a few of you with date conflicts, I have decided to change the date to Saturday, June 4th ,4-6 pm. I personally have not had a date conflict since collage! In any case, the protocol for our social will be the same in respect that couples are asked to bring a small appetizer to share and singles can mooch. Also, our resident Cajun Bob will provide his amazing musical engineering, along with his team of jamming musicians. A small change… I have decided to make a change to alleviate the time-consuming and confusing three-ticket process for the enjoyment of glasses of wine. So, rather than $20.00, we will charge $10.00 per person to cover the entertainment, along with, winery setup and cleanup. In regard to wine, we will simply charge $5.00 per glass of your choice to be paid at the bar(s). Every guest will get one ticket at the door for a chance to win an adoooorable door prize. Save the date and don’t be late! Your guests are welcome. Ron Lanza and Frank Musto, and families, will once again visit us, May 1st. It would have been nice to have them with us for the June 4th social, but the timing of Ron’s trip from CA did not accommodate that likelihood. As I often say, we have a wonderful opportunity as a winery on the east coast to resource the best wine grapes in the land. In addition, they are now our good friends. I get to personally pick what vineyards, from both hillside and valley, our wine grapes come from. It’s as close to having our own vineyards as it gets without growing the grapes ourselves. As much as I would have enjoyed farming, I think my plate is full at this stage. My goal to produce amazing wines has been made possible with our west coast opportunity. All 2012 wines have been history for a long time now. Our 2013 Fusion cab blend is now sold out. Our 2013 visZINary zin blend will be sold out over the next two months. There is still time to get some of this gold medal winner. Our limited 2014 Rapture Sangiovese will be sold out sometime middle to late summer, along with Star Spangled Sauvignon Blanc and Innocence Rose by the fall. To date, only the COOP has been privy to both 2014 Fusion and visZINary reds, but the general public will have that opportunity shortly. We will begin bottling the 2015 reds late summer and into the fall. I must say, I have been more than pleased with all the wines we have produced. Always remember, COOP members can always pick up additional wine at their COOP reserve discount level at any time. I have a few 6 liter Fusion bottles left. I use to have them left and right, now just left! I will soon have a 3 liter bottle of Fusion and possibly for visZINary. These larger bottles are great for special family occasions and toga parties. In the past, our busy season was when we made wine in the fall. Our new paradigm falls into the realm of tours and tastings for individuals and groups. This has become our new life. It’s great for the winery, but was not anticipated to be as time-consuming as it is. I think I stated this in a past update, but we are now in the entertainment business. The public very much likes our tasting room ambiance, our branding and especially our wines. Last Saturday, for instance Diane and I had 63 wine lovers visit the winery from 11:30 until 5 pm. Some were scheduled but at least half just found us on the internet and stopped by. In addition, the winery has become a sought-after venue for group events. For example, the Cape Cod Chamber of Commerce had their 85+ member gathering at the winery last Wednesday, and there seems to be an event of some type weekly. Our 5-Star status on Trip Advisor and our Google presence now attracts many from far and wide and the busy season has not even started. Diane and I will do our best to satisfy this new happening, but I do foresee a day when we will require assistance. I hope this does not sound like complaint. The notoriety and accolades about our wines is a wonderful compliment and bring us much satisfaction,… so much for retirement! Keep your eyes out. That does not sound like something an eye doctor should say, but in any case, I was just interviewed for a story about winery by the Cape Codder. It should be in print sometime in May. Dennis Harwich Lion’s hosting a fun event for all! !